The Arizer Extreme Q is a top-quality desktop vaporizer and is one of the best options available under $200. It is just as good as any high-end desktop vaporizer yet costs nearly half the price. This is the perfect vaporizer for people that are sick of hurting themselves using conventional vaporizers. They might end up burning your throat and lungs. This is for people who want a new experience and haven’t used bags before. As a result, they are looking for a new, better, and more satisfying way to vape their herbs. When I first looked at the Arizer Extreme Q, I thought that Arizer had started making coffee makers. This is exactly what it resembles. The shiny, metallic covering makes it fit in with any home appliance. Furthermore, this should be the direction for desktop vaporizers. The metal also allows for no bad aftertaste like plastic often does. This is great and I wish more people would take note. It’s one of the few times this has been done, and I’m honestly surprised it doesn’t happen more. The Arizer Extreme Q comes with a remote control. You don’t have to be right next to it to turn it on. As a result, by the time you get to it you’ll have the vapor built up and ready to go. It may not have many uses, but you will get some work out of it. As soon as you attach all of your things it’s ready to go. You can turn it on and change the temperature or adjust the fan speed as you see the split. The controls are very easy to use because there is no way to misinterpret them. If you want dense vapor, change the fan speed to a lower level, and vice versa. I’ve used very few vapes that market the fact that they have great fans. Therefore, they should do it way more often. The fan on the Arizer Extreme Q is super quiet. After a couple of sessions, you’ll probably forget that it’s there. The constant fan whirring that you hear from others will not annoy you with this one. Consequently, it allows you to relax while vaping. The cleaning and assembling of the glass parts on the Extreme Q are pretty fragile. So if you drop them, they will probably break. However, if you clean them properly you get extremely clear vapor. This is a pretty fair trade if you ask me. The assembly also provides great taste. Arizer combined all of their strengths with the glass tubing and ceramic heating to get the best flavor possible. The Extreme Q comes with all of the essentials. It comes with whip bags, multiple mouthpieces, extra screens, a remote, a stirring tool and even more things. Nothing malfunctions, and everything is in great condition. The warranty doesn’t cover glass breaking, so you need to make sure to be very careful with those parts. It’s a bit of a learning curve to learn how to use the bags. After that, they become much easier. You can also shell out an extra $100 for a battery pack. It is in case you do want to take it camping or somewhere with you. However, it still costs less than most of the desktop vaporizers that you would usually buy. Before you start using the Arizer Extreme Q, make sure that you have the herb in the bowl. If you try to add it after, you won’t get the same taste. 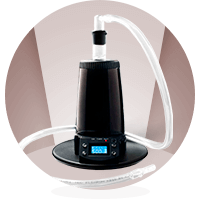 Once you start puffing, you will be able to see that the vapor production is excellent on the Arizer. It can even rival the Volcano. You can attribute this to the ceramic bowl because it’s known for producing excellent taste and vapor quality. The only negatives that I’ve found about the Arizer Extreme Q is that the glass parts are very fragile. They require constant cleaning which is a bit annoying. Otherwise, it’s worth it when you’re getting such clear clouds. If you don’t clean the system, you’ll regret it in the long run. It’s because it not only starts to tarnish but it also slows down very quickly because of the gunk build-up. Even if you don’t usually do whips, try it at least once with the Extreme Q. Everything you need for it comes in the bag already. Moreover, you’ll just have to get the hang of it. It’s because the unit doesn’t come with something that automatically closes the bottom like most desktop vapes do. This is the perfect introductory desktop vaporizer. If you’ve only used portable vaporizers, this should be your first one because it is simple to you. Additionally, you don’t have to have a degree in rocket science to work it. You can compare this to the other big names in the class. After doing a cost vs. value analysis, it is clear that the Extreme Q beats the competition hands down. With most other desktop vaporizers, it seems that people are often buying them because they have the reputation. However, most of them are crazy expensive and have unnecessary bells and whistles. Sure, with the Arizer Extreme, you might not get that great reputation. 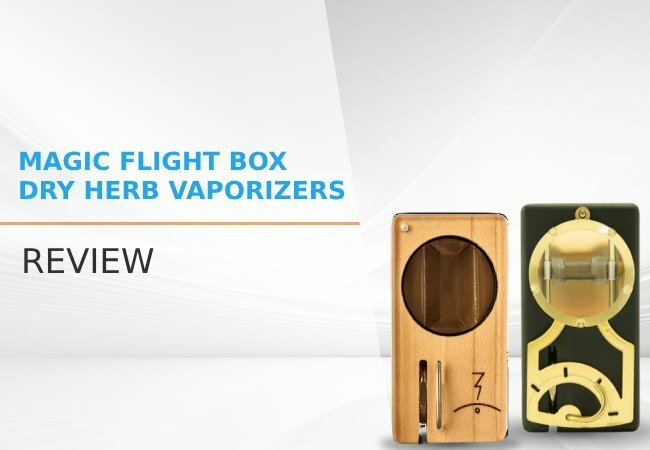 You will definitely get a great vaporizer that works superbly with herbs instead. You’re getting something that will last and something that you can use on a regular basis. I wholeheartedly recommend that you get the Arizer Extreme Q. You will get a great desktop vaporizer at bargain bin prices. 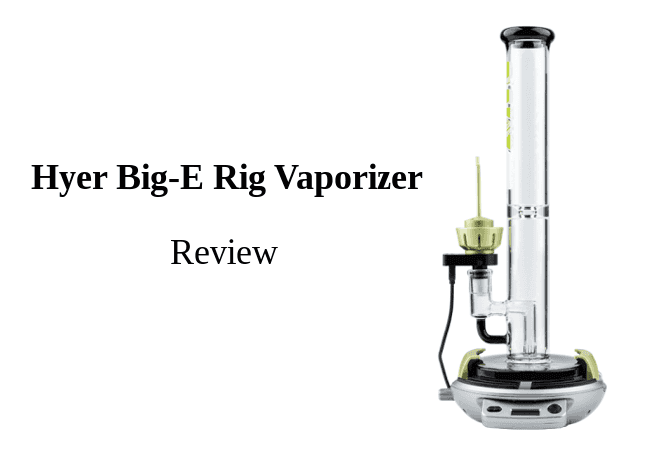 The Hyer Big-E Rig is an electronic nail kit that is great for dabbing. Read ahead to learn more about this e-nail. I recently got a 2017 Extreme Q and one of the key upgrades they’ve made is to the glass elbows, which are the things that used to break or cause restricted air flow. Both elbows appear to be much heavier/stronger glass compared to my buddy’s, which he purchased in 15. The elbow for balloons is now all glass and of excellent quality. I’ve been both surprised and impressed with Arizer’s improvements. I’d say much less worry and less need to consider the Silversurfer elbows.